I was reading and came across these two fantastic quotes from nay-sayers on new technology. It's easy to imagine similar thoughts being expressed about e-commerce, mobile and more recently social media. The moral is to keep an open mind and be a continuous learner, not overly relying too much of your current expertise and history to-date, otherwise you could end up in the spectacular fail club below. What motivates you to be involved in social media? Social media is a fundamental shift in business and communications – it’s something you need to be involved in stay in the game. That might sound like a grandiose statement but I truly feel that social media will have as big an impact on our business as the invention of the Internet and our move into e-commerce. It’s like the telephone. Many years ago there used to be “telephone departments” and people with “telephone” in their job title. It was a niche area for experts that understood this amazing technology. Nowadays, there’s a telephone on everyone’s desk and a mobile phone in everyone’s pocket and it’s deeply integrated into everything we do. There are no longer specialists, it’s just how business gets done. Social media is exactly the same. In 5 years time I see it deeply integrated into the online, retail and call centre buying path for our customers, social media training will be part of all new employees induction into Dell and we’ll even encourage all of our team members to Tweet, Blog and spread their thoughts and ideas to customers through social media. It’s amazing to think that this could even radically transform our customer service and marketing teams. For example, do we need “faceless” marketers if a customer can talk directly to the team designing our products? It’s an incredibly interesting (and somewhat scary!) future. I’m really passionate and motivated by this. What tools do you use and how does social media help you perform your role? Chatter is a fantastic tool for sharing information and insight with internal teams. Externally, I use Twitter and LinkedIn to publish a lot of “thought leadership” material on digital marketing, e-commerce and social media. I also have a Blog “Digital Future” but I feel bad because it’s not updated as often as it should be. I also often check out local forums and blogs to see what customers are saying about Dell, our products and the website experience (my day job!). It’s fantastic to get real-time, honest feedback from customers on what we’re doing right and where we can improve. I use Facebook quite a bit, but more to check out Brand pages and applications, less about personal use. I keep Facebook for my private time and limit this to friends, family and close colleagues. Before you really got involved, did you have to overcome any fears about it? If so, what kind of fears? I’m probably one of the exceptions to this, as I’ve been in digital marketing for over 15 years and absolutely live and breathe new technologies like social media. However, privacy is still one of my key concerns. I love connecting with people via social media but I clearly keep my professional contacts on LinkedIn and Twitter, with my friends on Facebook (or other closed networks). Location-based services such as Foursquare are a concern, as it’s easy to get excited about “checking in” and forget that not everyone has the best intentions (i.e. an extreme example: you’re signaling to thieves that you’ve left your house!) but the potential benefits and sensible use really offset this. The other worry I have is that everything you do on the Internet and in social media is permanent. You can never have a bad day and vent your frustrations – there’s always going to be a record of unruly behavior, so it’s important to think before hitting Enter. What are the obstacles to getting involved in social media? One of the biggest issues is finding the time to share thoughts, ideas and excellent content. I do a lot of my online research first thing in the morning or in the evening and then I put all my Tweets and other content into a scheduling app called Buffer (www.bufferapp.com). This way my content is sharing throughout the day and I can focus on periodically checking Twitter, LinkedIn and my Blog for comments or questions. This is a wonderful time-saver and really helps coordinate my use of social media. Are there people you modeled your social media efforts on? If so, who? There are a number of excellent social media news outlets that I read every day: Mashable, TechCrunch, Business Insider and Penn Olson (in Asia). These blogs/publications are really valuable for getting to the pulse of what’s happening in the social world. As for people, I tend not to look at the usual US social media leaders and look more for great content in Asia. Since my role is already very digitally focused, I seek out my colleagues in similar organizations (Marketing and Digital/Online leaders at companies like Microsoft and Intel) and at our competitors (Apple, HP, RIM, Nokia, etc). It’s great to get fired up with a strong sense of competition when you see that we’re pulling ahead of our rivals – everything is much more transparent and real-time in social media, and I get a great sense of how we’re doing competitively in real-time. On an individual basis, we are very lucky to have one of the most social media savvy CEOs ever. Michael is a real inspiration and we’re very lucky he’s been such an advocate of social media. This strong executive support has fundamentally transformed Dell and is one of the big reasons customers see us as forward thinking and innovative. First we got the direct model right, then e-commerce and now it’s social media. This makes me proud to work at Dell. How would you quantify the ROI you’ve experienced in social media, personally and professionally? On a personal note, I’ve met a lot of excellent professional networking contacts that have made me more successful. This has been done through LinkedIn and Twitter. Internally, Chatter has allowed me to connect to people in other parts of Dell that I wasn’t aware of previously. Dell really does operate through a network of informal contacts in a highly matrixed organization, so Chatter is a great tool for helping build those relationships. In a business sense, there’s an even more clear ROI. In my role managing APJ digital and e-commerce, I see fantastic returns from our group buying and social merchandising activities. There’s also great benefits when you think about social networks as a CRM platform. We have customers who have given us their contact information, are willing to be contacted and, like email, we see increasing return on investment over time. The critical issue here is that we need to maintain the conversation with our customers every day – reinforcing Dell brand values, discussing how awesome our products and are how much we care about our customer’s needs. 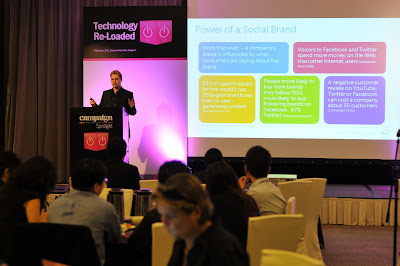 My interview with ClickZ Asia: Dell's social media listening command centre, social commerce & staff training in social. The original post by Adaline Lau appears on ClickZ Asia. For a brand that went through Dell Hell five years ago, the American PC manufacturer has not only bounced back from its social media nightmare but has become one of the most well-known global case studies for making money on social media platforms. Today, Dell earns US$15 million in revenue driving deals through @Delloutlet to its more than 1.57 million followers on Twitter. The company also boasts a strong social media presence with more than 40 Facebook profiles worldwide, with thousands of staff representing the company on Twitter, and it has cracked the China market by becoming the most popular business brand in the country’s top social networking site RenRen with 800,000 fans. Damien Cummings, online and social media director, Asia Pacific and Japan from Dell shared the company’s success in social media commercialization and marketing on the first day of SES HK 2011. Cummings said a key social media strategy for Dell is content and listening and it is putting serious resources into doing that by setting up a Social Media Listening Command Center in Austin, Texas last year that now monitors around 25,000 conversations daily. With Asia Pacific becoming an increasingly important region, particularly markets like India, Australia, China, and Japan, Dell has rolled out a mini version of the social media listening practice in India this month. He said that the company is in the process of setting up a social media listening hub for Asia either in Singapore or Malaysia with a headcount of 10 staff comprising listeners, a leader that oversees analytics and CRM, as well as community managers that are trained in using social media for customer enquiry. The Asia arm of the social media listening command center will also include presence in China that is scheduled to go live in the next six months. Dell currently uses Radian 6 for social media monitoring and CIC in China but Cummings said they are considering local monitoring companies to fill the gaps for other Asia markets. While Groupon and LivingSocial have converted many consumers to group buying, which is sometimes lumped into ‘social commerce’, this concept is not new for Dell. The company launched a global pilot of the strategy in Singapore in May 2009, originally called the Dell–Intel Swarm. Since then, Dell rolled out an improved version in Canada, followed by Australia and is now live in the U.K. with plans to launch in other Asia markets such as China, Japan, and Southeast Asia. Facebook commerce is an emerging platform that Dell is exploring. However, Cummings said he is “not putting big bets” on F-commerce because the social network is more of a platform to connect with friends than transactions so user-generated content such as ratings and reviews is key on the social site. Getting executive buy-in at Dell is not an issue since its founder and CEO Michael Dell is a big believer of social media. However, training 100,000 employees is no small feat. Not only does it involve human resource but a logistical challenge as well, which is now managed by a two-person team globally. Within the company, employees have to undergo training from a specific curriculum before getting certification and so far 9,000 have graduated from the program. “Having a social media policy in place is absolutely critical”, said Cummings, as the rights and responsibilities of each employee will be based around the policy. Nonetheless, the internal training is by no means about producing ‘Dell robots’ but to keep to key principles such as protecting information, being transparent, responsible, and nice, having fun, and connecting. “It starts with listening. You need to understand your customers. Many marketing driven campaigns are based on big ideas, forget that. You need to listen and identify key influencers”. “Use your social media as a CRM platform. If you think about fans, likes, followers and connections that you are developing, think about how you develop an engagement plan. And treat them the same way you would treat direct mail/email because it’s exactly the same, you need to keep them interested and you need to keep getting the sales message out to them”. Campaign Spotlight: Technology (Singapore). Great Feedback & Pictures. 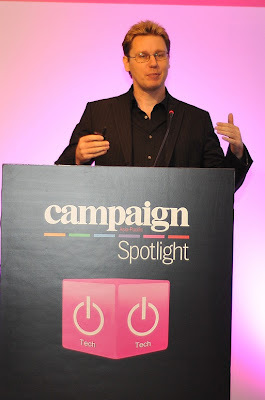 Last week I spoke at the Campaign Spotlight: Technology event in Singapore. I presented on "How to get started and make money from social media" and presented Dell's case study on our social media success. I'm very pleased that I was rated the top speaker of the event (thank you to everyone who was there and participated). If you want a copy of the presentation please feel free to reach out to me: Twitter @damiencummings, LinkedIn: http://sg.linkedin.com/in/damiencummings. Here are a couple of photos from the event too. Social Media Lessons From The Corporate World For Medical Professionals. It's been a while since I updated but I've got a whole load of things to add over the coming days - stay tuned! Here's the complete, unedited and raw article for your reading pleasure. In my current role, a Social Media and Online leader across sales and marketing at Dell, I talk a lot about the commercial risks and opportunities that social media presents. On one hand, there’s a risk that employees could say the wrong thing – anything from inappropriate comments about or to customers, offensive remarks, inappropriate behaviour or even releasing confidential company information (often inadvertently but in the worst case scenario, deliberately). The opportunities however, hugely outweigh the negatives. Social media gives a commercial company fantastic, unmatched connection directly to customers. No longer are big companies faceless corporations. The real people within a brand can talk directly to customers – the guy who designs a product can have a meaningful conversation with customers who use it, feedback can be given directly to staff developing, managing or supporting a product and of course customers can talk to each other about their experiences in virtuous circle of positive feedback, real life tips on their experience and self-help when things go wrong. When asked to look at the risk and benefits of social media for the Australian medical profession, much of this equally applies. There are great lessons from the world of business that can be of great benefits to patients and a real professional advantage for Australian doctors who have the courage to embrace these new opportunities early on. Medical professionals face a dilemma in both engaging patients directly through social media and in managing social media platforms (like a Facebook page or Blog) where patients can meet and swap health information. Should you be too involved in a patient’s life? What if people come to the wrong conclusion about a medical procedure or diagnosis (made worse by the social media community validating that diagnosis, without actually ever seeing the patient)? And of course, there’s a challenge in maintaining the time required to “seed” content into these communities, directly respond to patient enquiries and maintain your Facebook, Twitter, LinkedIn (etc.) profiles. Firstly, there’s a real opportunity to differentiate your practice and be seen as a medical thought leader because of your presence in social media. Successful Doctors spend an enormous amount of time networking, keeping up-to-date on the latest best practices in medicine and forging a name for themselves through word-of-mouth, media and patient referrals. Social media puts this into hyper drive and can turn a struggling practice of talented media professionals into a thriving business. Patients talk. Social media amplifies this talk in an unprecedented way. Secondly, social media is fast becoming the preferred method for patients to understand their health and how to get the best treatment. Previously, I worked with a baby milk brand who was marketing their products directly to pregnant women in the early stages of pregnancy. Their entire customer relationship management and engagement plan was based around one key customer insight – in the early stages of pregnancy there is a large amount of doubt and risk. In those first three months of pregnancy, Mothers will not reach out to their families and friends but they will turn to strangers anonymously to understand if what they’re going through is normal, what they should expect and to understand what they should do next. Their strategy involved having women who have gone through pregnancy before managing their communities (Facebook, Twitter, Blogs, etc. ), being available via Online Chat, as well as more traditional call centre/telephone. This remarkable strategy was the core pillar of their marketing and has built enormous loyalty (close to 90% of Mothers choose to stay with the first baby milk brand they choose. This is up to 4 - 5 years of brand loyalty). The first thing you need to do is listen. Whether this simply look at medical or health forums or your own Facebook or Twitter profile, or all the way up to working with a specialist provider of social media listening services depends on how deeply you want to engage. At Dell, there are 25,000 daily conversations about the brand. We use a global software tool called Radian6 to monitor those conversations. It’s as simple as setting up “key words” in the web-based software. For Dell, its phrases like “Dell”, “Laptop” and “Alienware gaming laptop”. For medical professionals this could be anything from symptoms to medicines to medical procedures. The important thing is that you, or someone you trust, is listening. Then it’s a matter of thinking about your social media presence as an editorial calendar. Social media is not static – it’s constantly evolving and needs to be continually updated. If you’re setting up a Facebook profile for your medical practice, I advise you to have at least a 6 month editorial plan, as well as at least one daily update (4 – 12 updates per day would be ideal). And the most important thing is to really engage. Whether it be a simple acknowledgement of someone’s question, or publishing an in-depth research report or thought leadership article you’ve written, just get out there, start engaging and you’ll see tremendous benefits. How are people really using LinkedIn? Here's a great Infographic that appeared on Mashable (from Charlie White). The methodology used in the development of this Infographic/research saw Researchers at Lab 42 ask 500 LinkedIn users how they used the service. Last week I did a joint presentation with Euan Wilcox, Regional Managing Partner from The Upper Storey (the digital agency that both Dell and Intel have been working with on Dell Swarm since the beginning) on the state of Group Buying and Social Commerce. The key highlight was discussing the next phase in the evolution of Dell Swarm, Dell's group buying e-commerce platform. Originally conceived as an Intel and Dell joint marketing effort, Dell Swarm was launched in Singapore in May 2009. As a marketing tool, it generated a lot of buzz but it wasn't the commercial success Dell was looking for. It evolved again and was re-released in Canada and more recently Australia. Each time, the Dell Swarm platform has evolved and improved. This year, Dell Swarm has just launched in the UK, is going into a new version in Australia and will be launched in Singapore, Malaysia and Brazil in the next 2 months, and in other countries like Japan and China later this year. And now it is the first company to develop a group buying platform. Here is a great video on how the Dell Swarm group buying platform works: http://vimeo.com/25024074. 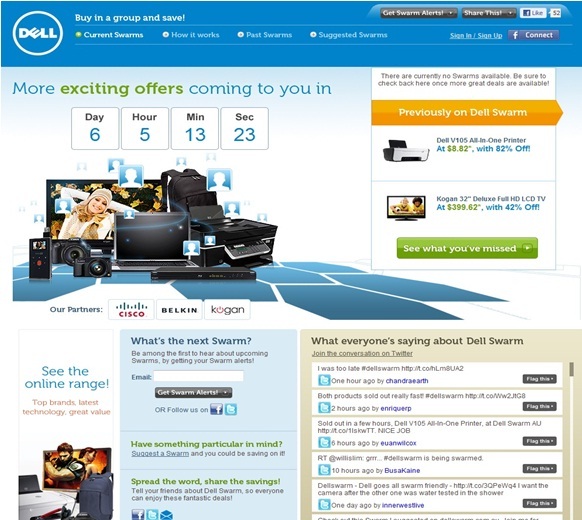 You can also find out more on Dell Swarm at: http://www.dellswarm.com/. I'd love to hear your feedback on Dell Swarm as I'm globally leading the program (and I consider it my "baby"). Thanks! Here's a great article (via Mashable) that presents a wonderful infographic (via OnlineMBA) on the rise of LinkedIn. LinkedIn recently passed 100 million users, meaning its population is bigger than most countries. But what kind of country would LinkedInLand be? An old, rich, well-educated one. According to the infographic below, created by Online MBA, 68% of LinkedIn users are 35 or older, 74% have a college degree or better and 39% make more than $100,000 a year. As those stats illustrate, although LinkedIn may not have the buzz of Facebook or Twitter right now, it has an enviable demographic base. The company also is profitable, fast-growing and expanding into new lines of business like news aggregation. As LinkedIn prepares to go public this year, here’s an overview of the phenomenon that Reid Hoffman created 8 years ago. 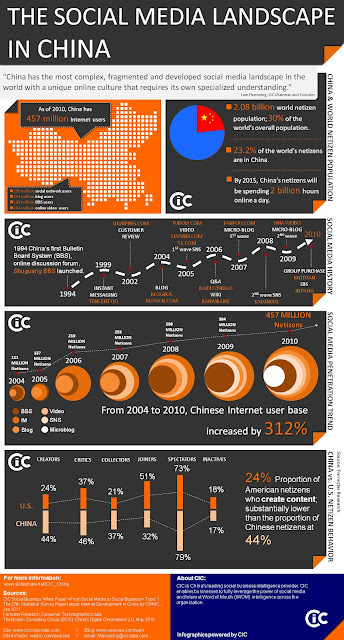 Here's a great infographic from CIC on the Chinese social media landscape. It's 2010 data and a lot has happened in a year but it's excellent for identifying trends and the big players. Here's a year-to-year trend from 2009 to 2010 in the changes in Twitter trending topics. 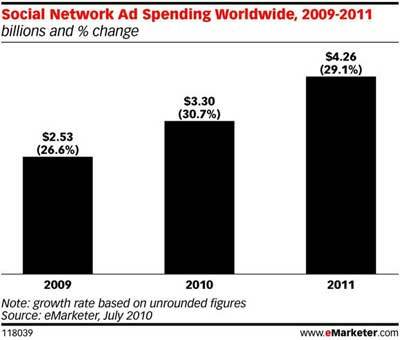 This data first appear on Ad Age and was compiled by trend tracking company What The Trend. In Simon Dumenco's Ad Age article, he summed up the changes as: "In essence, Twitterers seem more and more interested in entertaining themselves and each other with hashtag musings than tweeting about commercially-produced entertainment." Here are the seven top online marketing trends. 1. Social media marketing goes mainstream. In 2010, corporate use of social media reached a tipping point. Companies will become more sophisticated in their social media marketing usage as they get more experienced. As part of this evolution, social media will extend throughout organizations, namely customer service. Further, social media advertising will come into its own and yield relatively stronger results as happens with any new advertising platform. It's also largely attributable to the ability to tightly target audiences based on social media activity. The one challenge to this progress will be Facebook, Twitter, and Groupon's high market valuations, potentially signaling a bubble. 2. 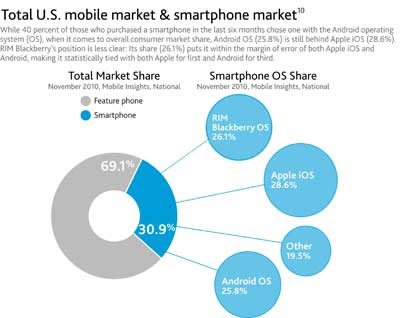 Mobile hits its stride. While U.S. mobile expansion has been on everyone's list for many years, 2011 will pave the way for a number of important marketing changes. Fueled by high smartphone adoption that continues to expand and an increasing percentage of mobile-only households, the U.S. is poised for enhanced mobile marketing. Recent Nielsen data shows that 30 percent of cell phones are smartphones and BlackBerries account for about a quarter of smartphones. Along with on-the-go consumption, e-mail remains the dominant mobile activity. Further, app users have downloaded an average of 27 apps. Based on this growth, Forrester forecasts that over 75 percent of marketers plan to include mobile in their marketing mix. Given mobile e-mail's strength and average app downloads, focus on mobile interactive extension to meet users needs on the go. 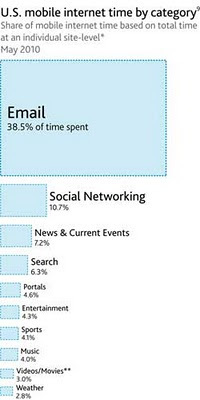 Think bite-size consumption and mobile findability (aka search). 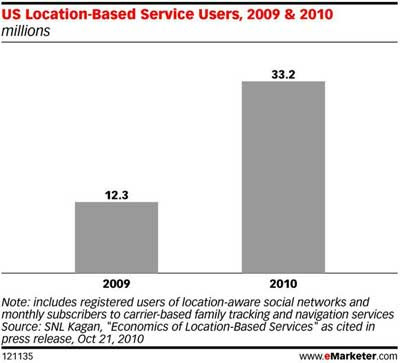 As a result, location-based services (aka LBS) such as Foursquare with competition from giants like Facebook will continue to expand their reach. QR codes and mobile payments will also grow. 3. Content marketing expands in new venues. Other forms of portable devices, namely e-readers and iPads, gain traction. Apple's iPad has sold 8.5 million units based on eMarketer's estimates. While Amazon has sold 8 million* Kindles, its highest selling item to-date. This is good news for publishers who consider these devices paid content consumption nirvana. These devices require that marketers think about their target market's content consumption habits. Roughly two-thirds of consumers have paid for some form of online content according to Pew Research Center's Internet & American Life Project. Among the dominant forms of paid content were digital music, software, cell phone and tablet apps, digital games, news articles or reports, and videos, movies, or television shows. But, before publishers run to the bank, they must assess the average $47 content spend carefully because the typical customer only spends $10! 4. Marketing goes real-time, not just watching issues for PR and potential fires. (Hat tip to David Meerman Scott.) Marketers must be vigilant to take advantage of marketing opportunities while mitigating the impact of small fires (for example, Ford's use of social media to quell a PR fire). This requires a more flexible promotional and communications strategy. As a result, marketing needs to be agile because these events can't be planned six months in advance. Further, every firm must have a crisis management plan and vigilant monitoring. 5. Online retail continues to take market share from other channels. Christmas 2011 showed that consumers were willing to spend money, either due to pent up desire or as shopping therapy, despite the challenging financial outlook. Online holiday purchasing grew, taking share from brick-and-mortar retail, showing consumers' willingness to use and trust online payments. J.P. Morgan senior analyst Imran Kahn forecasts that U.S. online retail will continue to grow at a 12.4 percent CAGR (compound annual growth rate) from an estimated $166 billion in 2010 to $235 billion in 2013. While a very small percentage of holidays sales, social shopping will continue to expand its influence due to its ability to target and reach consumers early in the decision phase. Also, group buying via Groupon and its competitors will continue to be a growing trend as long as marketers can make money from these promotions. 6. Integrated marketing comes of age. As the big social media marketing campaigns of 2010, namely Pepsi Refresh and Old Spice, showed, integration across marketing platforms is a must! With expansion of social media marketing; mobile, e-reader, and offline marketing (remember, television still dominates!) all need to work together. 7. Metrics move into the spotlight for social media. Just as you do for traditional forms of marketing, as social media matures and invests real budget and headcount, management will require justification for these dollars. To this end, better social media metrics and a clear pathway to ROI is needed. Related to this is improved social monitoring to aid tracking. Further, marketers must incorporate calls-to-action and promotions to aid tracking. As you plan for 2011, use these seven online marketing trends to guide your marketing initiatives. Bear in mind that to hit your 2011 goals, you need to have metrics including those for your social media and mobile strategies that help you achieve your corporate mission.